Redco™ Nylon offers high load bearing capabilities (up to 4000 PSI), light weight, self lubricating and a low co-efficient of friction. Redco™ Nylon is easily machined and is an outlasting, outperforming replacement for traditional metals and other plastics. Redco™ Nylon’s toughness, low coefficient of friction and good abrasion resistance make it an ideal replacement for a wide variety of materials from metal to rubber. Using Redco™ Nylon reduces lubrication requirements, eliminates galling, corrosion and pilferage problems, and improves wear resistance and sound dampening characteristics. It also weighs only 1/7 as much as bronze. Redco™ Nylon has been proven in a multitude of parts for such diverse industries as paper, textiles, electronics, construction, mining, metalworking, aircraft, food and material handling. 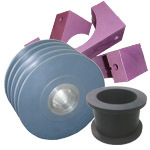 Redco™ Nylon is easily fabricated into precision parts using standard metalworking equipment.